We spent a week in Fort Bragg for spring break, and while we were granted gorgeous weather for most of our trip, the week prior was filled with storms and rain. This meant that many of the state parks in the Mendocino area, like Van Damme State Park and MacKerricher State Park, has trail closures from mud, small landslides, and washouts. At Russian Gulch State Park, the Fern Canyon Trail was closed, but we were still able to explore the beach and hike the Headlands Trail to Devil’s Punch Bowl, which is what I really wanted to see. Named after Russian Gulch Creek Canyon, the 1,035 acre park is a destination for camping, hiking, beachcombing, biking, horseback riding, tidepooling, and rock fishing — and in the spring, the grassy meadows are dotted with beautiful wildflowers. Our visit began by following the curving one-lane main park road under a large concrete arch bridge to the beach at the bottom of the canyon with a small parking lot, restrooms, and outdoor showers. The beach sits directly under the Frederick W. Panhorst Bridge. Constructed in 1940, the bridge rises 100 feet above the beach from the bottom of the gulch. It was early in the morning and completely quiet except for the gentle waves hitting the sand and the occasional car passing above. Once again, we were the only people at the beach. We LOVE getting up early because it means we usually get to enjoy the most beautiful places in solitude and silence. Russian Gulch Beach is a great beach for families. It is protected by a small bay and doesn’t get the heavy surf other beaches in the area do. Russian Gulch Creek empties into the ocean at the beach and the creek water is a great place to splash and play. After exploring the beach, the piers of the bridge, the end of Russian Gulch Creek, and hunting for shells and treasures, it was time to explore the headlands and see if we could find the famous Devil’s Punch Bowl. While we could have parked a little closer to the actual Headlands trailhead, we opted instead to park at a shady grassy picnic area overlooking the beach so we could have a snack there after our hike and follow the small trail the connects the picnic area to the Headlands Trail. The Headlands Trail was flat, easy, and remarkable. The views were amazing and we had a blast exploring the cliffs and watching water shoot from blowholes in the rocks below. After walking all the way around Devil’s Punch Bowl and snapping a lot of photos, we headed back the way we came. The rest of the day included visiting Jug Handle State Natural Reserve, Point Cabrillo Light Station State Historic Park, Ten Mile Dunes Natural Preserve, and Pudding Creek Beach. Russian Gulch State Park, with 15 miles of trails, five of which are open to bicycles, is one of the most popular hiking destinations on California’s Mendocino coast. The trails pass in and out of shady forests, beautiful picnic areas, and rocky coastal bluffs, along a babbling creek, past a gorgeous 36 foot waterfall, around a punch bowl, and to a quiet protected beach. The Headlands Trail is an easy, 0.75 mile out and back walk, totaling 1.5 miles, that begins at the picnic area overlooking the Frederick W. Panhorst Bridge and boasts spectacular views of the Pacific Ocean. The trail travels southwest along the cliffs, at times coming very close to the edge, before turning north to take you to and all the way around Devil’s Punch Bowl. The Fern Canyon Trail is a moderate 2.5 mile out and back hike, totaling 5.0 miles. Beginning at the trailhead at the east end of the campground, the trail follows an old logging road alongside Russian Gulch Creek to a 36 foot tall cascading waterfall. Add another mile or so to your hike by adding the Falls Loop Trail. Devil’s Punch Bowl is a 100 foot wide, 60 foot deep partially collapsed sea cave in Russian Gulch State Park two miles north of Mendocino, California. 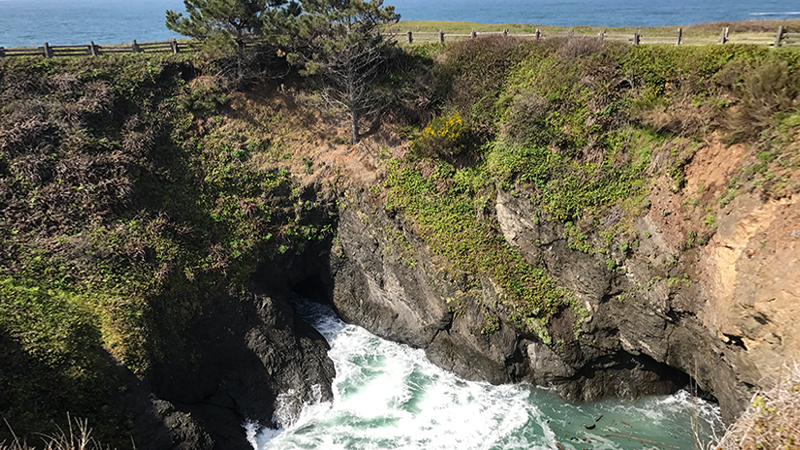 Also called a blow hole, Devil’s Punch Bowl is the most famous feature of Russian Gulch State Park and is easily accessible from the park’s Headlands Trail. It began as a sea cave reaching 200 feet into the rocky coastal headlands with a small hole in the top of the cave. Over thousands of years, the crashing waves pounded against the ceiling toward the back of the sea cave, slowly eroding the edges of the hole, making it bigger and bigger. This created a blow hole and as water sprayed through it up into the air, the ceiling of the sea cave continued to break down until it finally collapsed, creating the punch bowl seen today. We visited the park during low tide and were able to see a small beach area at the bottom, but during high tide, the waves churn inside like a boiling cauldron, occasionally spraying into the air. Government surveyors named the area Russian Gulch to honor the Russian fur trappers who founded Fort Ross fifty miles to the south. In the early 1880s, several homesteaders filed claims on the land and some stories tell of a Fort Ross deserter who lived there. For many years, Russian Gulch was a fishing boat harbor and stop for freight and passenger ships. In the 19th century, schooners dangerously made stops in the small cove to take on both passengers and coast redwood lumber. The headlands still contain iron rings used to hold ropes and move lumber when these ships docked. In the mid-1920s, a Los Angeles real estate developer purchased the land around Russian Gulch with the intent of opening a coastal resort. But in 1928, the Native Sons of the Golden West launched a movement to have Russian Gulch set aside as a state park. In 1933, the State of California acquired the land and in 1934, Russian Gulch State Park was dedicated. Russian Gulch State Park is located at 9500 North Highway 1, Mendocino, California 95460 just 2.0 miles north of Mendocino and 7.0 miles south of Fort Bragg in Mendocino County. The California State Park covers 1,162 acres, has 7,630 feet of rocky coastline, and boasts the Devil’s Punch Bowl, the Frederick W. Panhorst Bridge, and a 36 foot tall waterfall. The day use area is open from 6:00 am to Sunset. The day use fee is $8.00 per vehicle. Download the Russian Gulch, Mendocino Headlands, and Van Damme State Parks brochure. Dogs must be on a leash no longer than six feet. They are allowed at the picnic area, beach, in the campground, and on paved park roads and the Headlands Trail.